While things may still be a sketchy on the future of Mulberry, after the announcement they will not be showing at London Fashion Week next season, they're keeping the press machine working in overtime these days with other news. Today, we received news of a brand spanking new collaboration with another legendary British brand. Mulberry and Mackintosh are collaborating! The design features the traditional Mackintosh shape which is accessorised by Mulberry flower lock buttons and a detachable Mulberry Heritage Check lining. 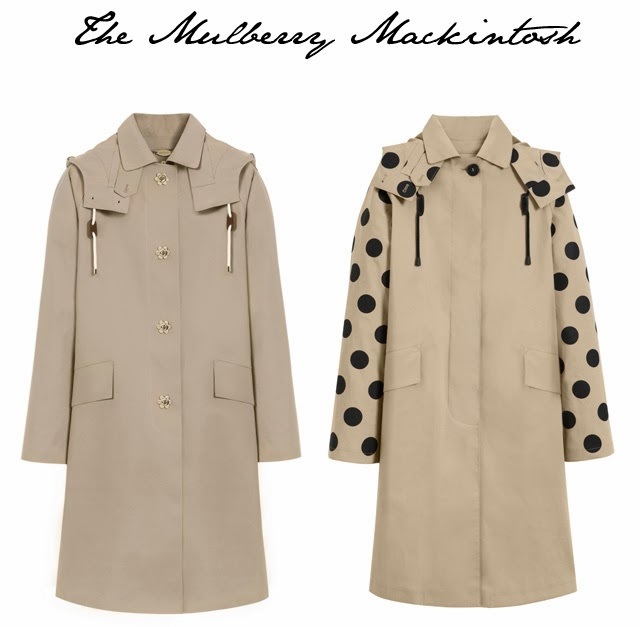 The Mulberry Mackintosh is selling on the Mulberry site for £1,750 and a new style will be available on Net-a-Porter from December 6th, and this one features polka-dot sleeves. So stylish, right?